What do we talk or write about when we talk and write about American film history? The answer is predictably complex and elusive. The American Film History Reader acknowledges and accommodates this complex task by showcasing a range of historical writing demonstrating that when we talk or write about film history we, by necessity, talk and write about a lot of different things. 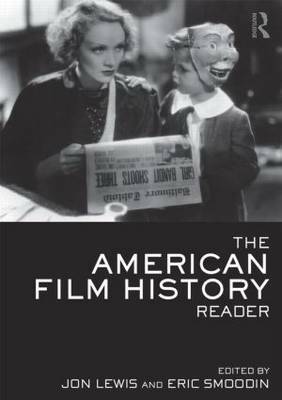 The American Film History Reader provides a selective history of American cinema and offers an introduction to historiographic practice in relation to American moviemaking and moviegoing. Appreciating that methods and materials change over time, this structure allows the editors to showcase a breadth of historiographic approaches and a range of research materials within each section. Each essay acts as a point of entry into a history that accounts for the essential and inherent commercial, experiential, social, and cultural aspects of the medium. All eighteen essays are individually introduced by the editors, who provide additional context and suggestions for further reading, making it an ideal resource for students of film studies and particularly for students taking courses on film history. "Lewis and Smoodin have assembled an absolutely essential reader for scholars and students of American film history. Structured around eighteen key essays, the book is far more than a survey of important films; it is, most importantly, a compelling reminder that any film history should reflect a spectrum of historiographic methods." "Lewis and Smoodin - the scholarly equivalent of a star-powered Hollywood double-act - have brilliantly assembled a collection of essays that enable readers to examine both the history of American film and the changing historiographic practices that address that commercial art form. I can think of no better guides, and the book they have produced will rightly become integral to the ways we teach American film history." "As editors, [Smoodin and Lewis] have distinctly articulated their reasons for each and every article and do a thorough job of situating each selection in both its framework and the larger field of media historiography... If there are individuals who cling stubbornly to the notion that an Ivory Tower still exists in academia, Eric Smoodin and Jon Lewis are certainly not among them. The publication of The American Film History Reader is a testament to their belief that there has always been more than one film history to write, and more than one method to writing it."